The decision to add a pet to your family is a big one. In addition to choosing what kind of pet to get, you must make sure to get a solid commitment from every family member that they will pitch in and take care of an animal, which is no small task. But it’s not all hard work because owning a pet can be incredibly rewarding and beneficial to everyone in the family. 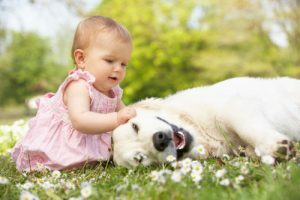 Studies have shown that kids who have pets in the home enjoy a more highly developed sense of empathy since they are always looking out for their animal’s wellbeing and emotions. Furthermore, pet ownership teaches responsibility, so try giving every family member a few pet-related chores, such as walking, feeding, brushing, or cleaning a litter box. You want everyone to feel involved and sharing these responsibilities will help everyone to manage the division of labor fairly. Sometimes, people with a child 18 months or younger feel it’s unsafe to bring a pet into the home. While this can be true with unruly pups, pets actually offer some health benefits for babies. According to WebMD, babies who grow up in a home with furry pets are less likely to suffer from pet allergies and eczema. Doctors believe this is because the child’s immune system becomes desensitized to animal dander at an early age. Shy kids can have an easier time opening up to an animal companion since having a cute pet is a great way to bond with peers. Kids feel more at ease around their pets, and it instantly gives them something to talk about with other people. Dogs are especially great for meeting people because dog owners congregate at dog parks and other canine-friendly areas. The health benefits are not just limited to children. A large-scale study that examined pet owners around the globe found that adults with pets had 20% fewer doctor’s visits than their non-pet-owning peers which is attributed to the that pets tend to relieve stress. Certain pets also encourage physical activity, which boosts overall health. If you’re not sure if your family can handle a pet, start with something small like a fish. You’ll get a lot of the aforementioned benefits, and consequently you’ll get to see if your family is ready to handle an animal that requires more care. You can also offer to babysit someone’s pet while they’re away. This will give your family a small taste of what pet ownership will require of them. With some careful consideration and little planning you’ll be ready for pet ownership in no time.